We continue to see debate around the trajectory of US labor markets. Measures such as the employment-population ratio have completely diverged from the "headline" unemployment rate. The explanation of course is reduced labor "activity", as individuals exit the labor force (see discussion). However, various studies indicate that the answer is not as clear-cut - due among other things to changing demographics. Historically older workers who are still of working age are far more likely to leave the workforce. As the US workforce gets older, there is some natural attrition that would have taken place even without the massive shock to the system from the financial crisis. Some researchers at the NY Fed did a good job in attempting to quantify that effect (see chart/link). These same dynamics are responsible for a portion of the decline in labor participation rate. BMO has done some good work in the area, which we try to summarize here. The historical trend looks quite unsettling, as the chart below shows. But there is an enormous difference in the "natural" labor force participation rate of a 55-year-old vs. say a 35-year-old - that is unrelated to the Great Recession. And as we get more 55-year-olds in the workforce, the participation rate "naturally" declines. BMO: - An aging population will continue to press down on the part rate, as persons 55 and over participate at only half the rate of prime-age workers (25 to 54), while persons 65 and over participate at just one-quarter the rate. If the downward pull from aging overwhelms the expected upward push from discouraged workers and college students returning to the labor force, then the part rate will decline further. BMO lists other reasons for declining participation that are unrelated to demographics. Instead these effects seem to be the result of government policy. 1. Since the onset of the Great Recession many more Americans have started collecting disability (from the Social Security Disability Insurance program) than in the past (see discussion). BMO: - In addition to the downward pull from demographics, disability rolls could continue to climb. Macroeconomic Advisers estimates that the Social Security Disability Insurance program, by discouraging participation, could have reduced the part ["part" is short for participation] rate by about 0.1 ppts on average from 2006 to 2013 [notice that this represents some hefty numbers on an absolute basis]. 2. Now that the extended unemployment benefits ended, more people are counted as having exited the labor force altogether because they are not officially "unemployed". 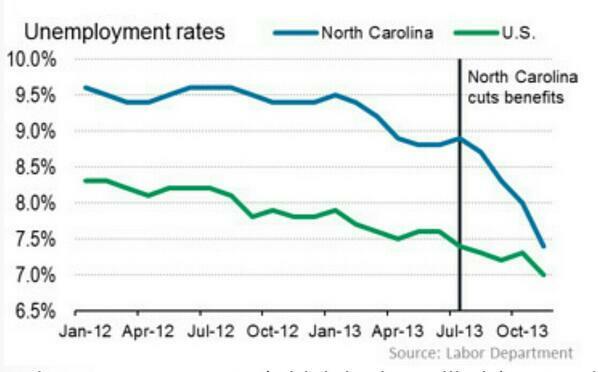 See this chart (from WSJ) on what happened in North Carolina after it cut benefits. BMO: - The expiration of the extended UI benefits program will also depress the part rate this year. Assuming one quarter of the 1.3 million people who lost emergency benefits on December 28 find work and another quarter leave the labor force, the part rate could fall 0.2% in 2014. This accords with the additional decline in North Carolina’s participation rate, relative to the national average, after the state decided to end extended benefits five months earlier. 3. Many analysts are suggesting that Obamacare will detract from labor force participation as well by making health insurance cheaper for those who have minimal income and incentivizing some to leave the workforce. BMO: - According to the CBO, the Affordable Care Act will likely also reduce the part rate, as new federally-subsidized private health insurance plans will reduce the incentive to seek employer-sponsored plans. Quantifying this impact, however, is virtually impossible. The hope is that the expected economic improvements over time will counteract some of these trends. The challenge for the FOMC of course is which employment measures to use for policy decisions and guidence. Clearly the traditional unemployment rate benchmarks are inadequate. The "activity" measures such as participation are driven by multiple factors, some of which are not directly related to the health of the economy. When is the employment situation in good enough shape to start raising rates for example and which measures do we rely on to make that call? This assessment challenge makes the Fed's "dual mandate" a particularly daunting task.